I gravitate to these colors. I also LOVE adding stripes and plaids. JUST for stripes and plaids. It EVEN contains some hand-me-down shirts! I seem to get hand me down fabric too! This plaid backing was given to me a long time ago. Who knew it would be JUST RIGHT for this quilt?? and I can call this quilt DONE! for more that 15 years! but this year was so busy, I just worked on this alone. 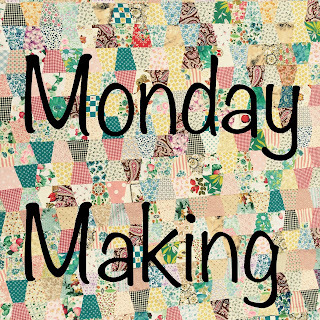 IT's time for MONDAY MAKING!!! to be auctioned off in April at a retreat. I like this springy group of squares! and we enjoy "HomeGROWN" at each meal! Gardening is a special KIND of making!! I am SO happy this happens at my house! I'm also HAPPY when I get to play with these three!!! Children and Grandchildren give us an EXTRA reason to MAKE!! This is the beginning of a toddler summer sweater. The pattern has long sleeves. I'm going to make them short. and trying my hand at hearts this week! This is a table mat made for a retreat auction coming up. I loved adding the hand quilting. a large needle and BIG stitches. I just echoed around the hearts and added some simple lines. The pattern for the hearts was found here. and added some 1 1/2" strips between. May your weekend bring you time to SEW!!! using scraps from my basket! but am SO tempted to use them in MY kitchen! they match my favorite pot!!! I used an old clean towel for batting. SUCH a wonderful tasty dinner! Butter makes everything super yummy! It was a week of small projects for me. going to a retreat in April. I found those pepper squares in my 2 1/2" square drawer. They make this table mat so BRIGHT and cheery! for a new member at church. I hope this little mat says WELCOME!!! that have been UN-finished for a couple of years!!! a little tiny pair of slippers. A new pattern for me. They're TOO small for granddaughter! Someone else will get to wear them. but THIS year has been the year of the waiting room! and THAT is when I get the most MAKING done. I knit at his therapy three times a week..
the other appointments that fill my calendar. It's taken me a LONG time to get this far! It IS the perfect take along. There are NO stripes at all!!! I love to "mess with" patterns. There was some making in my kitchen this week too! NON-edible carrots....made by my granddaughter. I'm SO happy I was able to squeeze a little quilting time in this week! and then auctioned off with the others at an upcoming retreat! This classic blue and white mix makes me happy!! The half square triangles are 2 1/2"x 2 1/2". This little quilt measures about 16 1/2" square. I sure like the way the striped fabrics give this quilt MOTION!! the polka dots give it "Happy"!! !